TV show dates: June 4, 2017 — July 8, 2018. Performers include: Melissa Leo, Ari Graynor, Michael Angarano, Clark Duke, Andrew Santino, Erik Griffin, RJ Cyler, Al Madrigal, Stephen Guarino, Jon Daly, Ginger Gonzaga, Obba Babatundé, W. Earl Brown, Jeffrey Nordling, Jake Lacy, Brianne Howey, Dylan Baker, Robert Forster, Cathy Moriarty, Sebastian Stan, and Alfred Molina. 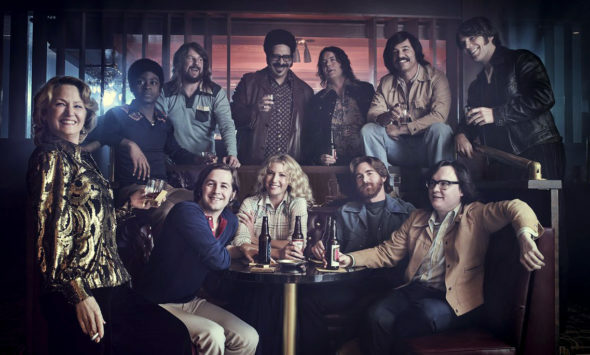 A gritty, fictional drama set in the 1970s comedy scene in L.A., I’m Dying Up Here explores the complex, inner workings of standup comics and their drive to make it. It is inspired by William Knoedelseder’s non-fictional book of the same name. The series centers around the regular performers at Goldie’s comedy club, owned by Goldie Herschlag (Leo), who is as tough as it takes to be successful in this business, for the sake of her club and her comedians. Goldie’s coveted main stage is seen as the ramp to The Tonight Show Starring Johnny Carson. And she refuses to allow young comics access to it, until they’ve proven they are ready, repeatedly, in open mic night performances, and on her stage in the cellar. Cassie Feder (Graynor) is a young comedienne, trying to break into this male-dominated world. She chafes at Goldie’s advice to find her niche as a female comic and refuses to be pigeonholed. With the feminist movement in full swing, Cassie openly demands the same treatment and chances Goldie’s guys get. Boston comedians Ron Shack (Duke) and Eddie Zeidel (Angarano) arrive in L.A., planning to crash with their friend, Clay Appuzzo (Stan). Clay finally made it to The Tonight Show, and Carson even waved him over to the couch. After watching his episode in a nice hotel room, and having a good meal and some beers, Clay stepped in front of a bus and was killed. Cassie, who is his ex, believes he committed suicide, but since the police investigation has made Carson’s bookers and advertisers skittish about booking young comics, she agrees to Goldie’s demand that she keep her theories to herself, in exchange for a shot on the main stage. With little money and nowhere to stay, Ron and Eddie end up renting a closet from another comic, which they must share with the cat’s litter box. Eddie is truly funny, but doesn’t know much about making it in the business. Ron is more of the sidekick type. Adam Proteau (Cyler) idolizes Richard Pryor and is working every angle to break into the business. In the meantime, he has to do some terribly demeaning things, in order to make a buck. Vietnam vet Ralph King (Griffen) is TV writer and a favorite at the club. An honestly funny, kind guy, he struggles with being overweight and has a few skeletons rattling around his closet. With a blisteringly acerbic wit, Bill Hobbs (Santino) has a successful act on Goldie’s main stage. He’s angry about the truths of the comedy biz and openly jealous of other people’s success. While he has a certain charisma, his negativity does not serve him well. Mexican-American comic, Edgar Martinez (Madrigal) is another regular on the main stage. Although fond of his weed, he’s so competitive that he is not above retaliation. With comedy roots that go back to the Borscht Belt and the Catskills, Goldie takes care of her young talent with generous doses of tough love. She also tries to teach them about the business and its pitfalls. During her years, she has built up a lot of walls, doesn’t have many deep connections with people, and is estranged from her teenaged daughter. Ralph and Adam’s bad news comes with a silver lining; Roy offers Eddie a big opportunity; Nick looks to make amends; Cassie struggles to decide where her loyalty lies, unlike Amanda whose path has never been clearer. What do you think? Do you like the I’m Dying Up Here TV show? Do you think it should have been cancelled or renewed for a third season? It is not yet cancelled- but has it been renewed? I am hoping the sheer quality of it gains a next season.. it is a flawless show in all ways. Can’t wait to hear it is still a go ….I am hoping that Carrey’s clout with Showtime helps it continue if it is not doing so on its own merit..